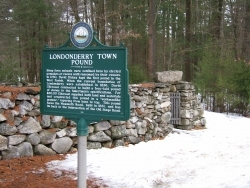 The immigrants who settled the Town of Londonderry, New Hampshire, were descendants of a colony migrating from Scotland to Northern Ireland (Ulster) about 1612. A large number of these Scotch-Irish settlers left their homes in Londonderry, Ireland, and arrived in Boston in 1718 to start a new life without religious wars and persecution. Of the five shiploads of people under the guidance of Rev. James MacGregor, one group remained in Boston, one group settled in Dracut and Andover and a third group ventured north to what is now Portland, Maine. A harsh winter and low provisions forced the third group to retreat south to Haverhill, Massachusetts, where they heard of a twelve square mile area “abound with nut trees”. Sixteen families left Haverhill for Nutfield in 1719 and on June 21, 1722, established a charter for the Township of Londonderry. Later, several portions of the Town were subdivided into parishes and other towns. Nutfield was the first inland settlement in the Merrimack Valley and originally included what are now the city of Manchester and the towns of Hudson, Windham, Salem and Derry (the oak grove). In 1741 a section was lost on the southern boundary to form Windham and Hudson; Derryfield (later named Manchester) was incorporated in 1751 and Derry became a separate town in 1828. In 1719 Nutfield had four Presbyterian ministers – James MacGregor, William Cornwell, William Boyd and John Holmes. The first sermon delivered in Nutfield was by the Rev. MacGregor under a large oak tree (now gone) on the east side of Beaver Pond. MacGregor organized the First Presbyterian Church in New England. The first colonial towns in New England were generally settled in the same manner, with settlers’ cabins built around a large open space called a common. Here the cattle grazed and were protected. As time went on, the settlements branched out and committees were established to portion out lots and divisions of the Common were made. Miles and miles of rugged stone walls were erected to mark the boundaries, to provide an orderly place of disposal for the many stones found in the region and to provide fencing for cattle put out to pasture. Londonderry was abound in butternuts, black walnuts, chestnuts, oak and hickory, which were used to supplement the early settlers’ limited diet and lumber materials. Hickory was used for axe handles and wagon wheel spokes; chestnut was used for fine straight-grained boards as finish work in homes and for furniture. In the 1920’s a blight hit the trees and destroyed the groves. The use of flax started in Ireland, and eventually linen making became the basic industry of early Londonderry. The Patterson Homestead (c.1729, destroyed by fire) manufactured and sold Londonderry Linen, which was considered to be the best in New England. Londonderry linen is claimed to have been worn by both George Washington and Thomas Jefferson. Because many people attempted to sell linen under the pretense that it was manufactured in Londonderry, the House of Representatives drew up an act to have a seal affixed to all linen manufactured in Londonderry in 1731 and by 1768, New Hampshire produced 25,000 yards of linen cloth annually. Apple Trees were brought to Londonderry by the first settlers, and by the early 1800’s became the major crop of many local farms. Apple varieties included Nod Head, Russet and Blue Pearmain. The McIntosh apple was discovered in Ontario, Canada around 1900 and is today one of the many varieties of apples found in Londonderry. From 1912 to 1914, McIntosh apples were in great demand throughout New England, especially in the Merrimack Valley. As a result many dairy farms changed to apple farms, producing smaller orchards. Apples were sold locally to a large extent until the 1920’s and 1930’s. By 1976, Londonderry apples were being shipped throughout the United States, Canada, the British Isles, Brazil and Venezuela. Mrs. William Morrison raised the first tomatoes in Londonderry in 1822. She transported the seeds from Octorara, Pennsylvania. The first potato ever grown in the United States was grown in Nutfield, now a part of Derry. Taverns existed in Nutfield from the earliest days and were used for storehouses of rum, brandy, gin, tea, coffee, sugar, molasses, snuff and tobacco. The taverns were the center of conviviality and lively discussions in the Town. Plummer’s Tavern (once called The Gregg House) was also used for public entertainment in addition to being a stagecoach stop. Here also the mail was changed. The building still stands at the corner of Route 102 and Mammoth Road (The Homestead Restaurant). White’s Tavern, built by Reuben White, accommodated 50 horses and was used as a storehouse for groceries and provisions. White brought many goods from Portsmouth. Presidents James K. Polk, Andrew Jackson, Franklin Pierce and Daniel Webster stopped here. White’s Tavern still stands today in the northern section of Londonderry. Londonderry Common, considered the center of Town, is an area which has monuments dedicated to the Veterans of The Revolutionary War, The Civil War, and World Wars I and II. A bandstand was constructed by the townspeople for activities such as Old Home Day, outdoor concerts and other special activities. The bandstand and the memorial to The Londonderry 99 (American Revolutionary War) were dedicated in 1976 during the Bicentennial Year. Surrounding the Common are the United Methodist Church, Londonderry Grange #44, Londonderry Presbyterian Church (the oldest continuing Presbyterian Church in New England, founded in 1735), and Old Town Hall (Lion’s Club). The Indigenous Peoples along the Atlantic seaboard belonged to the great family known as the Algonquin. They were brave, fearless and were greatly attached to their land, as indeed, were all Indians. Living in what was later known as Londonderry and the region thereabouts (at the time the first settlers came to Londonderry in 1719) were the Pennacooks. Musquash, a large swamp area in Londonderry, was the native name for “muskrat”. Few things are left of their culture except for fragments of their pottery, arrowheads and the names of rivers, mountains and towns.